Looking to bring some balance back to your website? Well, Rebalance will help you do that! Rebalance is a simple portfolio theme for photographers, artists, and graphic designers looking to showcase their work. It was designed by Automattic’s very own Mel Choyce and inspired by the classic Imbalance 2 theme. Rebalance‘s clean look and large-format imagery make it great for displaying artwork and photography. Its responsive layout is optimized for all devices and its great typography keeps your text legible and stylish no matter the size of your screen. It comes with six custom accent colors to choose from and supports a site logo, so you can tweak the design to your liking. Featured Images are important in Rebalance. Featured images appear in several places, including archive pages, the portfolio page template, and the homepage, so don’t forget to add one that’s at least 1200px wide for every post or project! The Featured Content area displays selected portfolio projects, and is displayed above posts on the homepage and above projects on the Portfolio page template. Create at least a few portfolio projects. For each project you’d like to feature, use the Tags & Categories area of the editor to add the tag you chose under Customize → Featured Content. Add a featured image that’s at least 1200px wide to each project you’re featuring. Rebalance takes advantage of the Portfolio feature on WordPress.com, offering unique layouts and organization for your portfolio projects. Learn how to enable and set up this exciting Portfolio feature. People love seeing full-size images of your work, so make sure the images you include are at least 1200px wide. Rebalance displays these images at nearly full width on larger screens. Include a site logo by going to Customize → Site Title and uploading a logo image in the space provided. The logo will appear next to your site title in the header. It can be any size, but will display at a maximum height of 80 px. Rebalance allows you to create a social links menu to connect your readers to your social media profiles, like Twitter and Facebook, using icons. Rebalance offers one widget area which can be configured at Customize → Widgets. Widgets will appear in the footer of your site. You can also add a Custom Header Image to give Rebalance a much more personalized look and feel. Rebalance has six built in color schemes to choose from including pastel teal and bright red; tan and bordeaux red; orange and dusk grey; and mint green and charcoal. The main column width is flexible and roughly 800px wide. 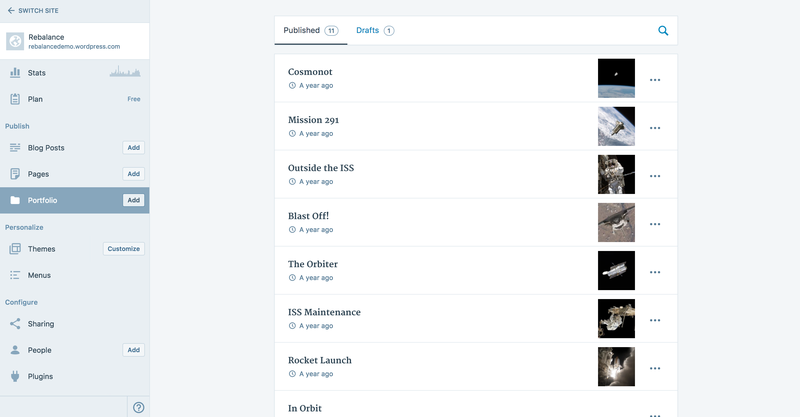 Featured images on single posts and single projects break outside of the main column and are 1140px wide. Custom header image should be at least 1140px wide. The sidebar is also flexible and each widget is roughly 360px wide. The site logo appears at an unlimited maximum width and a maximum height of 80px.